It is the time of year again - the season of cold, wet, subzero conditions (unless you are in Australia, of course :)) that have a major impact on our animals´s and our immune systems and general health. Winter has its demands on our bodies and the immune system has to deal with a lot. The wet, cold, icy, snowy conditions, together with the changing of temperatures as we take our dogs out from warm apartments and houses for a walk outside and back again, all this makes for example arthritic animals get worse in their symptoms than during the warmer months. As the immune system is weakened, we can often see our dogs catch kennel cough at this time of the year. I would like to share a recipe with you all, that is a great, simple and economic aid to your dog or cat´s menu, which they will thoroughly enjoy. The bone marrow broth is wonderful and important food source for your dog or cat, beneficial in many cases of compromised health. Let´s take a look at a few of them. 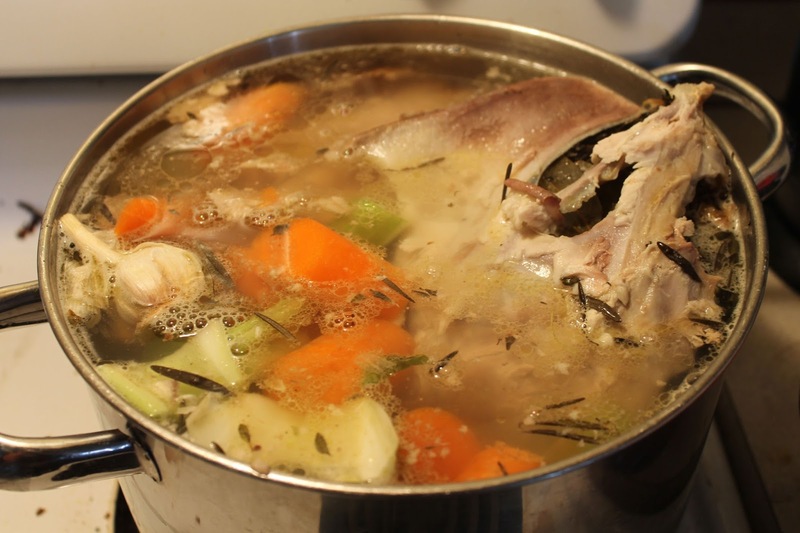 Bone marrow broth is rich in proteins, GAGs (glycosaminoglycans) minerals and other micro-nutrients, many of which are antioxidants, important for your carnivore´s health. Bone marrow itself has the ability to build immunity, assist with blood clotting, and provide oxygen to cells. It has the ability to help body rebuild and speed up wound healing. 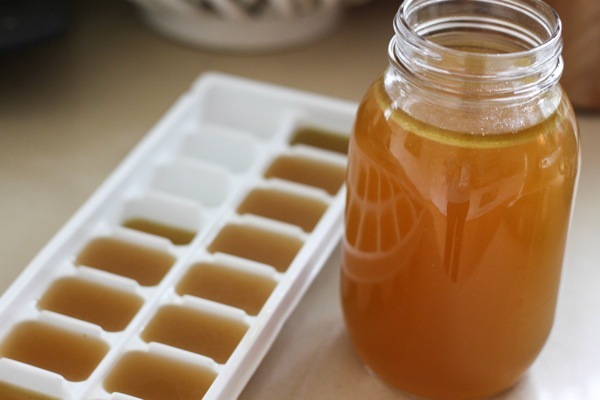 Bone marrow broth supports kidney and digestive tract function. In my personal experience and practice, I´ve been successfully using bone marrow broth for dogs and cats that are very weak from illness or due to old age, those recovering from a hard physical performance, lactating females after giving birth, dogs with kennel cough, cats with cat flu, pets that are to weak to eat on their own and are in need of nutritious boost and energy income, dogs that live outdoors during winter time for warming and immune system support and those animals suffering with arthritis. I also use and recommend bone marrow broth when transitioning your dog or cat from processed commercial pet food or cooked food to raw, species appropriate diet, and as a great supplementation of important nutrients if you feed your dogs or cats mainly with processed foods. 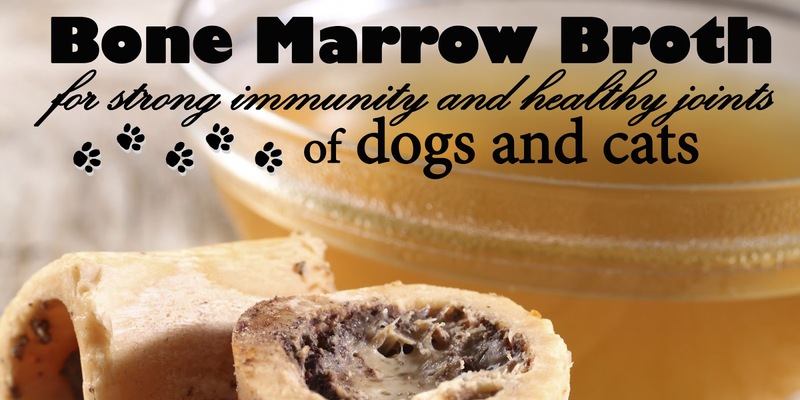 When it comes to supporting our dogs´s mobility, weather they are old, arthritic, suffer from rheuma and aching joints, sustained injury of their mobility aparatus, or are a large breed, bone marrow broth is what I call a "liquid gold". It contains very important proteins and glycosaminoglycans (GAGs) such as chondroitin sulfate, hyaluronic acid, glucosamine and collagen, all very crucial for keeping your dog or cat´s mobility in good shape and without pain. As you see, there are many proven benefits of this simple food. If your dog or cat doesn´t suffer from any health issues, they can appreciate it for its warming qualities at this time of the year and they will definitely endorse the taste! you can add raw minced meat just before turning the heat off, which will make a perfect meal for transitioning your dog or cat to species appropriate diet. 1. Put several pieces of marrow bones in a large cooking pot. You can choose just one kind, or blend them. I most often use beef bones and from time to time add chicken thighs and wings, occasionally pork bones. 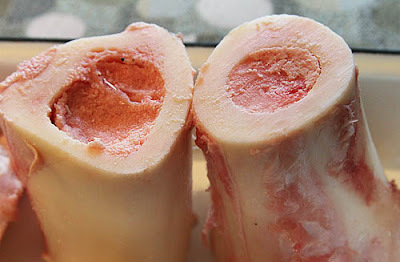 It is important that the bones are cut at least on one end, so that the marrow inside them can soften while cooking and loosen out of the bones. 2. Add water. The amount will depend on the amount and size of bones and the pot. Let water cover the bones completely and add extra couple inches/centimeters. Because you will be cooking the broth for an extended period of time, you have to count with the water amount reducing itself. That will also cause the final result be nice and thick. At least that is how I like my recipe to turn out. 3. Bring to boil under a lid, then turn the heat down to as low as the cooker allows, while still boiling gently. 4. Keep checking from time to time and let boil on very low heat for at least couple of hours. The length of cooking will depend on when does all the meat, fat and marrow detach from the bones. 5. Once everything loosened up, you can help the marrow get out of the bone (I often use a chop stick or a small grilling pin), then let simmer as long as needed until the collagen turns into jelly and everything kind of blends together. 6. Last step is to remove all the bones and make sure you did not leave any small pieces behind. Those could potentially harm your dog or cat when ingested. You can put the broth in canning jars and refrigerate them - this way it will last for up to a week. You can also put it in small trays or ice cube trays and freeze it for later use. My mom freezes these smaller portions of bone and meat broth for her cats in the standard ice cube tray (pictured on the right). We have big plans of building an outdoor stove for the kennel, where we will be able to cook about 20 liters (5 galons) of bone broth at once for all our huskies as the bone marrow broth makes a perfect after training energy recharging drink for the sled dog athletes. Hope you enjoyed the recipe and if you liked it, don´t forget to share it with your friends on FB, Pinterest or other platforms.